Choosing to work out with a Personal Trainer is an empowering decision that can transform your life. Perhaps you want to develop a more positive outlook on exercise, or maybe you need a little extra motivation, or the expert eye of a Personal Trainer to help you stay focused. Whatever your goal, having a scheduled session with a Personal Trainer will help you get there quickly. Our Smart Training programs, and the philosophies they’re built on, have been transforming lives since 1981. The Workout Personal Training program is no different. Our trainers are hand-picked and employed by us. Their skills, experience and qualifications are of a high degree and you only need to ask their clients to find proof of the results! With so many fad diets, exercise plans and challenges around, it’s hard to choose an option that will suit your body, mind and lifestyle. The best approach is a healthy and safe approach and, at Workout, we believe that listening to YOU is the key component for successful, sustainable results. Workout is all about Team YOU! Our Personal Trainers listen and work with you to establish realistic, attainable goals. Better still, they also work with our HIT (gym floor) Coaches to ensure that your Personal Training session extends beyond the one-on-one time you spend with your trainer each week. We believe in training smarter, not harder. Our Personal Trainers meet you at your level and encourage you to stretch that bit further to get results. The Workout Personal Training approach is realistic and productive. Our program relies on teamwork between you, your trainer and our qualified coaching staff. You’re not alone. We’ll reach your goals together! Workout Personal Training sessions are both time and cost efficient. Your 30 minute session will give you exceptional value—you’ll look and feel fitter in no time, and it won’t break the bank! 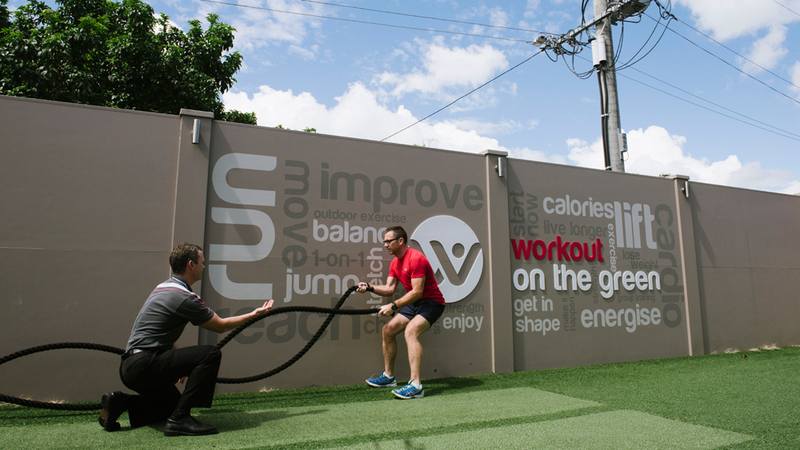 Take your health and fitness to the next level with a Workout Personal Training session today. Our awesome, highly skilled trainers can’t wait to meet you! Book me in for a Personal Training ‘Goal Session’ now!